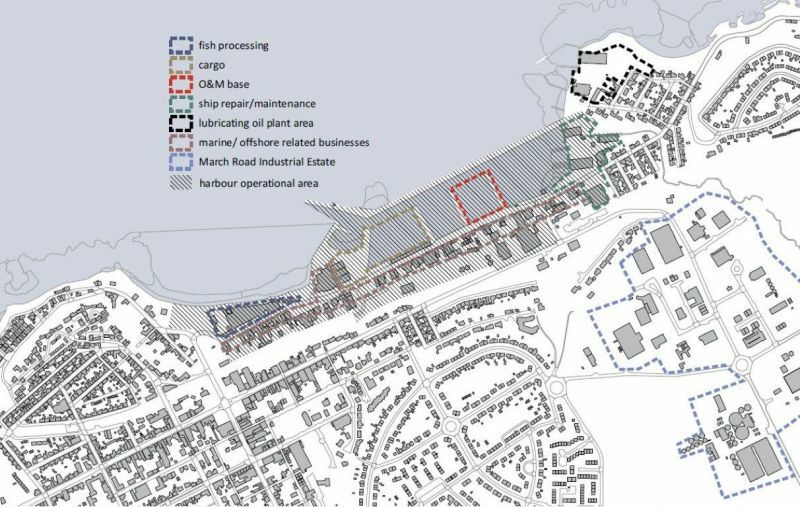 This masterplan was prepared for Highlands and Islands Enterprise (HIE) and The Moray Council by a consultant team led by Nick Wright Planning which included WMUD, Brian Burns Associates, Ryden and yellow book. 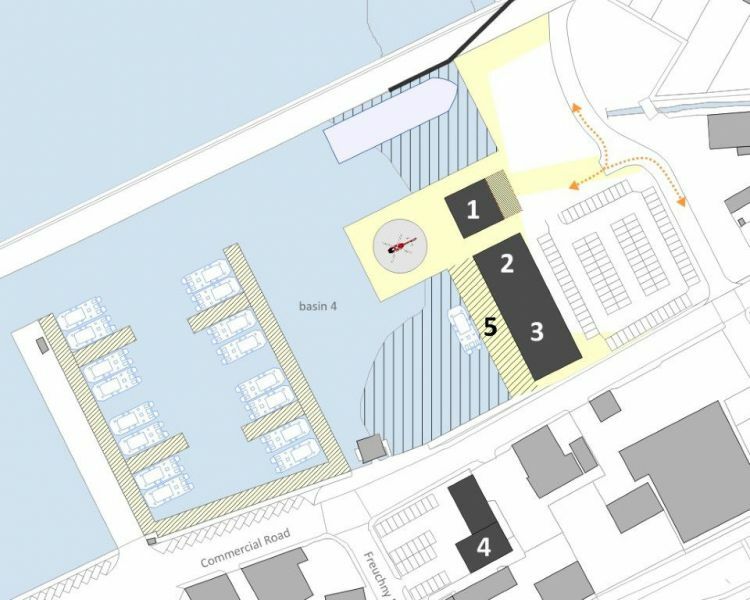 The brief specified that the masterplan should be predicated on Buckie Harbour continuing to operate as a working commercial port, and that the completed report should assist with demonstrating the potential of the harbour area to investors. Buckie has a population of just over 8,000 people. 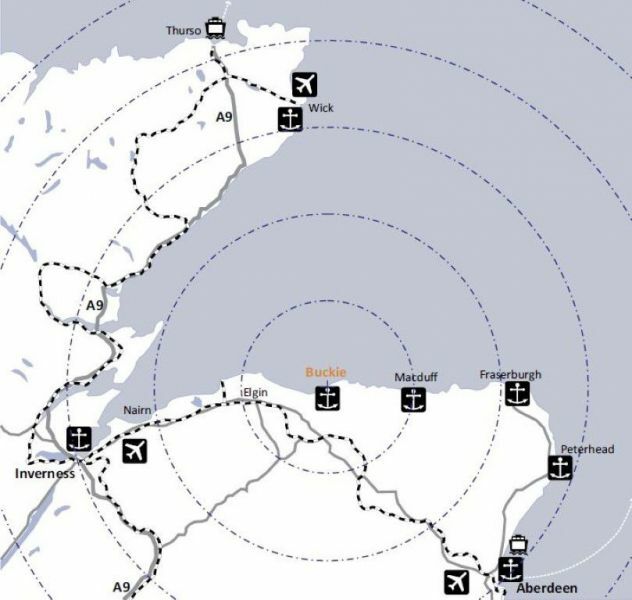 Inverness and Aberdeen (and their airports) can each be reached by road in around one hour, and Edinburgh and Glasgow in around 3 hours. Buckie Harbour has developed incrementally over many decades. It has 4 basins, each measuring between 0.7 and 1.5 hectares, and a total of over 1,100 metres of usable quay. The maximum length of vessel that can be accommodated is approximately 86 metres, the maximum beam is 15 metres and maximum draught is 4.5 metres. The tidal range is 4.8 metres. The harbour is sheltered and rarely closed in bad weather. 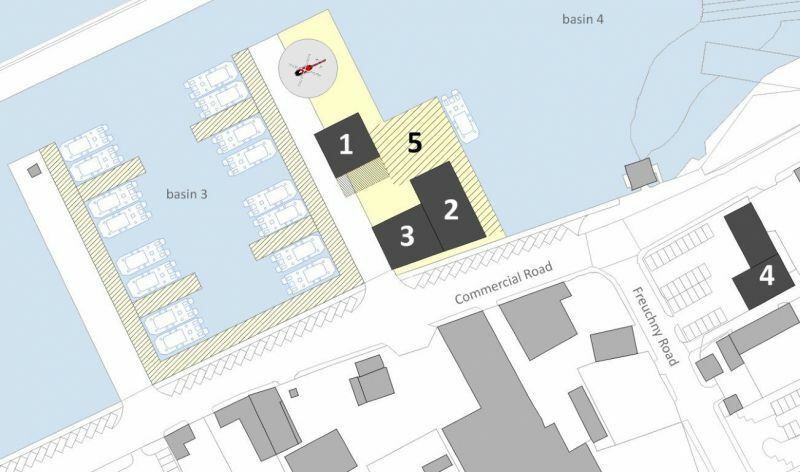 Existing facilities include a harbour office open 24 hours a day throughout the year, public weighbridge, stevedoring and cargo storage, RNLI lifeboat, and fuel, water and power supplies. Buckie Harbour is a commercial working harbour based around cargo (e.g. salt, grain, timber, metal fabrications and oils), shipbuilding and repair, and fishing; the exact composition of trade and tonnage fluctuates over time. In addition, there are a number of indigenous businesses based around the harbour (see next column) and a substantial supply of property. The harbour authority, The Moray Council, is keen to support greater commercial activity at the harbour in line with their shared ambition with Highlands and Islands Enterprise that it should play an even greater regional economic role in the future. The current strengths of the harbour area include a core group of key businesses, all locally owned: Associated Seafoods, Cluny Fish, Forsyths, Macduff Shipyards, Northern Oils and Regency Oils. Each of these firms has a stake in the future of Buckie Harbour; some of them have made major investments and others have plans to do so. In aggregate, these businesses have invested more than around £15m in buildings and other infrastructure around the harbour over the last 15-20 years. All are confident about future business prospects at Buckie. Other strengths include the adaptability of the harbour area, with development land close to the water and in the immediate vicinity. There appears to be sufficient capacity (in terms of port infrastructure and available land for development) to meet most of the known needs and aspirations of landowners and occupiers, even accounting for the ambitions of some individual businesses to consolidate or expand their presence. The Moray Council’s aspiration to attract offshore wind O&M (operations and maintenance) work forms the backdrop to this study, and provides a major potential opportunity in terms of economic activity. There are currently four offshore wind farms proposed to be developed in the Outer Moray Firth: one by Beatrice Offshore Wind Limited (BOWL) and three by Moray Offshore Renewables Limited (MORL). Each proposed wind farm would generate approximately 500-600mw. 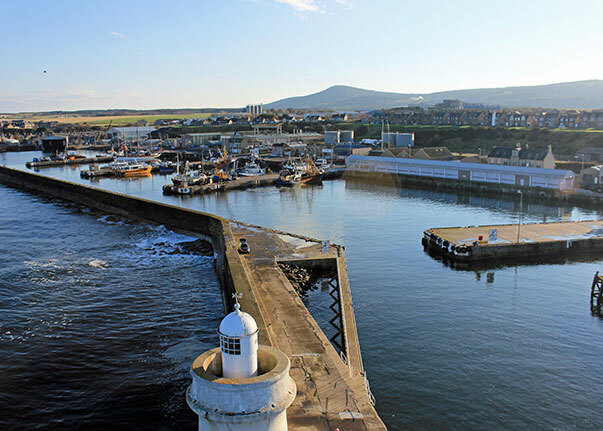 Buckie Harbour lies between 25 and 35 miles from BOWL and MORL and is one of three candidate harbours, alongside Wick and Fraserburgh, for the provision of port-based O&M once the proposed wind farms are operational. The greatest opportunity appears to relate to MORL, which is closer to Buckie, and any other longer term proposals that may emerge. This will be explored in more detail later in this section. Other ideas mooted in the course of the study include land acquisitions and possible investment to increase the capacity of the port, such as Northern Oils’ aspiration to create a deep water port which would extend beyond and encircle the existing harbour. This would be capable of accommodating large cargo/supply vessels and cruise liners. Through the course of the masterplanning process, the consultant team scoped the likely requirements for O&M facilities through a combination of research and a site visit to an existing offshore wind O&M facility at Lowestoft. 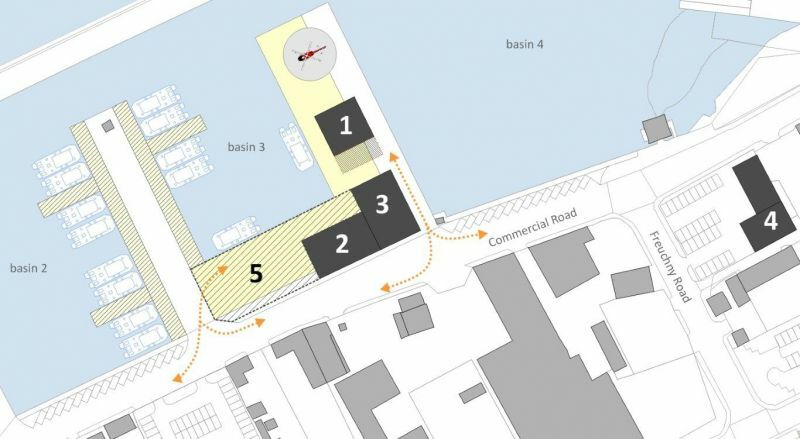 This has meant that we were been able to plan the components of the masterplan with a fair degree of confidence in the O&M contractors’ likely harbour requirements. 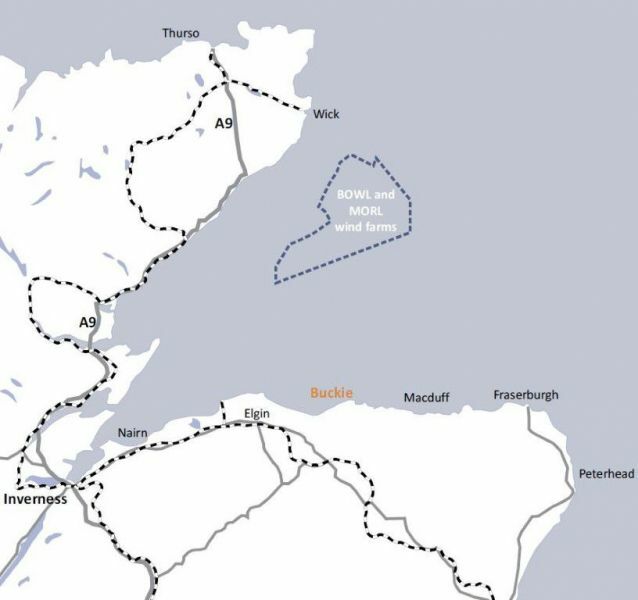 Buckie has a strong case to make for being selected as the port base for O&M activity particularly in relation to the proposed MORL wind farm which is around 29 nautical miles to its centre, less than Fraserburgh or Invergordon for example. All options are realistic and workable, but each has different benefits. Options 1-3 provide the best fit with O&M contractor’s likely requirements. The purpose of these options is to enable discussion on the most appropriate way forward. The preferred option may ultimately combine elements from different options in response to the contractor’s particular requirements. 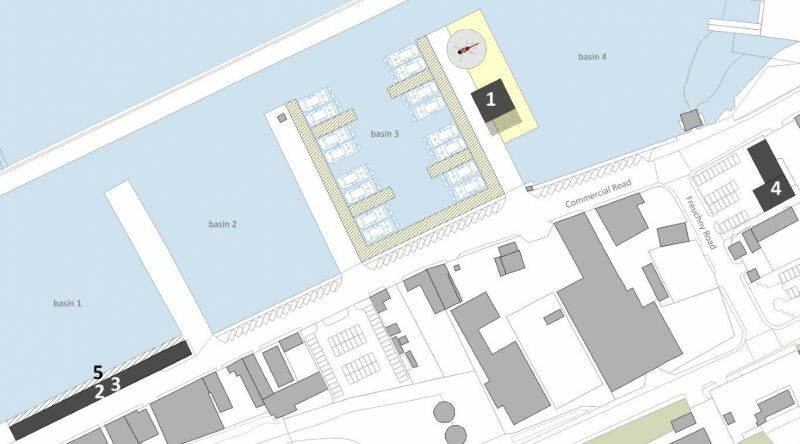 All options require some infill of existing basins; the Crown Estate own part of the harbour sea bed and any proposals would require to be discussed with them. Supply chain business centre (15-20,000 square feet): this would provide serviced accommodation and/or training facilities for growth firms related to the offshore energy industry. 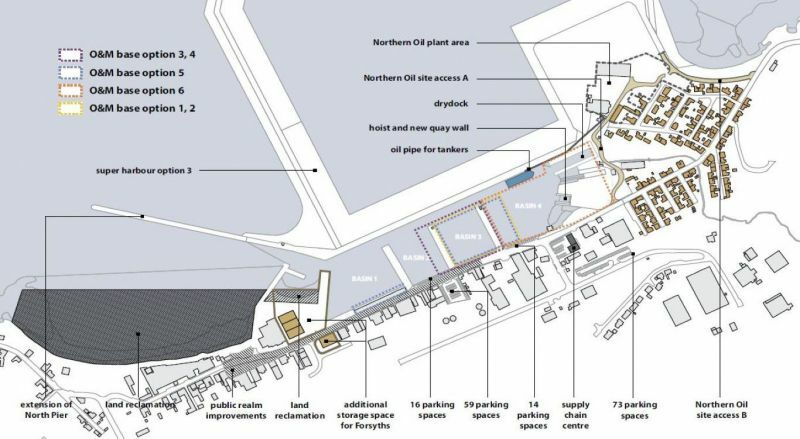 It is proposed on the site of former Buckie Drifter, a key site in the heart of the harbour area, as indicated on the O&M options plan (pages 18 – 23). While this site is ideally located to support this facility, an alternative location in Buckie (such as March Road Industrial Estate) may also be suitable. Expanded harbour for larger vessels and cruise ships: this is a long term aspiration would require construction of a new access along the shore to the east, and would enable additional investment in oil supply and transfer facilities. Potential land reclamation west of harbour entrance: this offers an opportunity to create additional commercial land, and could be developed as part of the long term harbour expansion project. 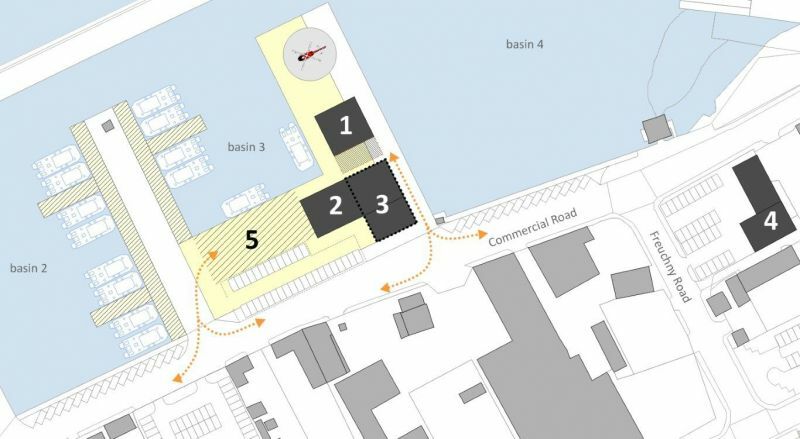 Placemaking improvements: these are designed to improve the nature of the harbour for business, residents and visitors and to provide better connections between the harbour and the town centre. The Moray Council and Highlands and Islands Enterprise (HIE) have identified, as a strategic priority, the potential to serve the developers of the world’s third largest offshore windfarm, proposed to be built in the Outer Moray Firth: the joint BOWL/MORL windfarm, which could see over 300 turbines constructed. 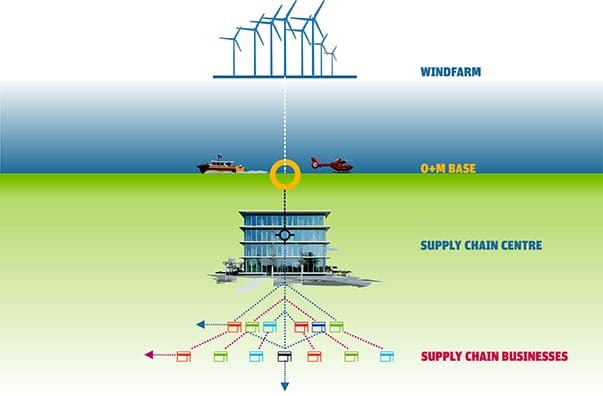 The joint windfarm could create 4,600 jobs at the peak of construction and 580 during the subsequent operational phase. In addition to this direct employment, there would be a substantial indirect impact around northern and north-eastern Scotland by stimulating supply chain and support business from skills training to maintenance and repair of support vessels.